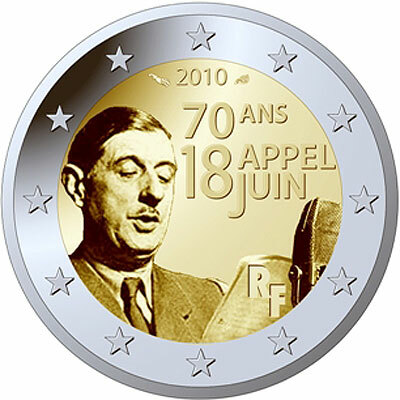 The coin commemorates the 70th anniversary of the appeal (“Appel du 18 Juin”) made by General Charles de Gaulle, the leader of the Free French Forces, on the BBC in London on 18 June 1940. Following the fall of France, De Gaulle spoke to the French people declaring that the war was not yet over. The speech is the origin of the French Resistance against the occupation during World War II.